Made in Italy by Industria Macchine Elettroniche ("a company of the Edison group") about 1964. 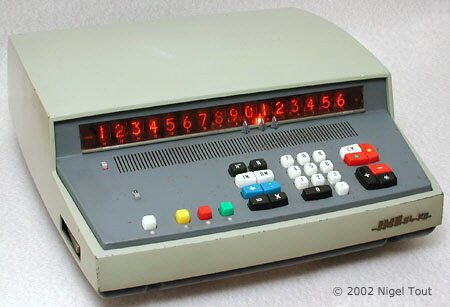 Ten-key desktop electronic calculator with "Nixie"-type tube display. 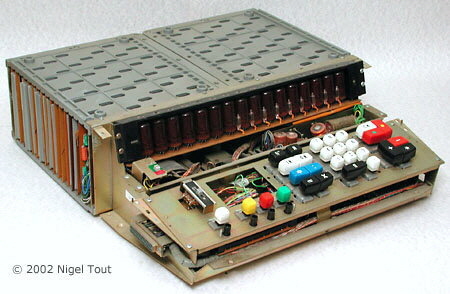 One of the first transistorised, desktop calculators. Has a range of peripheral equipment which makes it very expandable. Capabilities - 4 functions, memory, raising to powers. Reported as - "3 registers plus a memory/accumulator register". Up to four remote keyboards can be connected to each calculator " [though only one keyboard can be in use at any time, see below]. The Digicorder converts the calculator into a simple programmable machine. Display - 16 digits, "Nixie"-type numerical display tubes. Technology - The 33 logic boards have a total of 424 Germanium transistors and 1074 Germanium diodes. It has a magnetic core memory, and uses a clock frequency of about 30 kHz. Size - 450 x 480 x 165 mm (17.75" x 19" x 6.5"), 15.6 Kg (34.5 lbs). "Introduced into Britain last month was the IME84 fully transistorized desk calculator ... 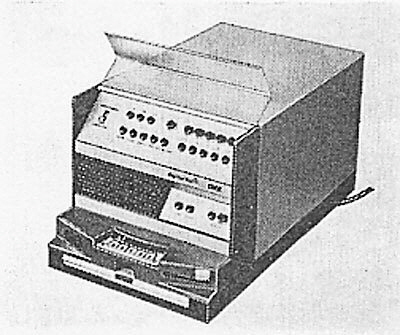 The machine has three registers plus a memory/accumulator register, each with a unique, extra large capacity of 16 digits. It will multiply and divide "instantaneously" and has the facility for re-reading the factors entered; holds constants for use as multipliers, dividend and division; can recall any result (including quotients) for further calculation; automatically raises to a power, with a check on the power. It is claimed that, for the first time in any desk calculator, the IME84 allows up to four additional remote keyboards to be connected to each machine. It is possible, therefore, say Muldivo, to develop systems of mechanizing calculations, so affecting a substantial reduction in the cost per operator of the installation. A whole range of accessories is being developed, the first being a multi-constant box to carry four eight-digit constants, any of which can be used at any time. Up to eight of these boxes can be connected to one machine." The British distributor was Muldivo. 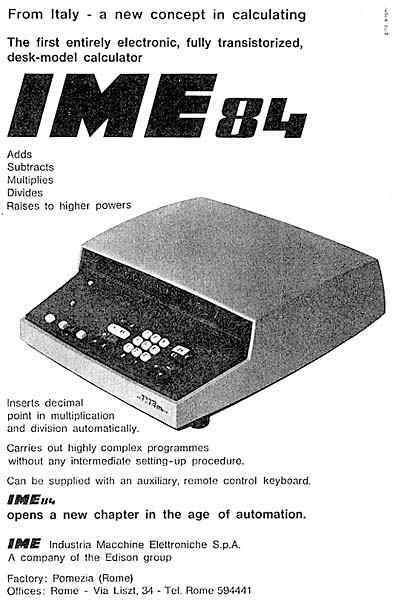 The IME 84rc is the Remote Control version of the IME 84. 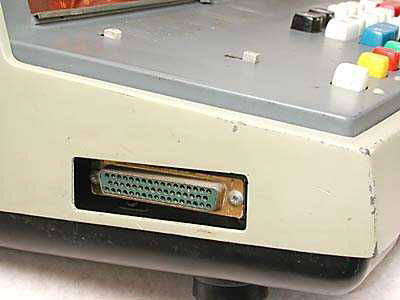 It has a socket on the left side for connecting remote keyboard and display units, see below. The IME 84, introduced in 1964, is a contender (together with the Friden EC130 and the Sharp CS10A) for the accolade of the first all-transistorised desktop calculator, see the advertisement below from May 1964. Advertisement from Office Magazine May 1964. An advertisement for another IME calculator in 1971 claimed "In 1963, IME, an electronic company of the Italian giant Montecatini Edison Group, designed the first fully transistorized Electronic Desk Calculator on a modular concept". Though note that although it was designed in 1963, it may not have gone on sale then. The keyboard of IME 84. is unusual compared with modern calculators. The functionality of the keys is described below. As with many new developments in technology, the keyboard has aspects of design based on the previous technology which were soon discarded as the result of experience. 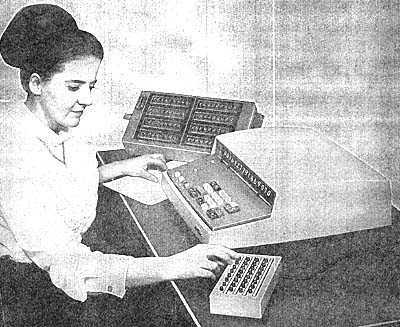 The keyboard of the ANITA was based on that of the mechanical Comptometer, whereas the keyboard and electronics of the IME 84 are based on that of a mechanical three-register calculator, such as the Odhner. If the lamp below it is not already lit, the red key on the left should be pressed to select the Input register. Numbers entered at the keyboard go onto the display and also into this Input register. 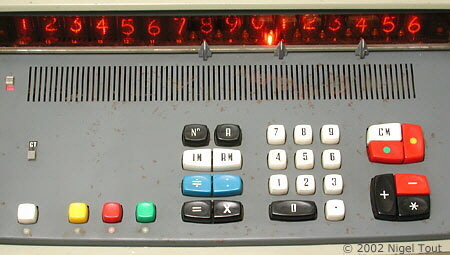 If the multiplication or division button is pressed the number is transferred to the Accumulator register, which can be viewed by pressing the green key. The yellow key allows the viewing of a register which is loaded with the quotient of a division, and so resembles the revolution counter of the mechanical caclulator. The "green" and "yellow" registers are cleared by the two buttons with coloured spots on the right. The white button on the left displays the contents of the memory. For adding and subtracting the buttons at lower right are used, with the * button revealing the total, as on mechanical add-listers. One oddity of the keyboard of this machine is that when a number key is pressed the number does not appear on the display until the key is released, which is disconcerting at first. It is possible to connect up to four extra, remote, keyboard & display units through this socket (see the article and photograph below). Though, only one keyboard can be in use at any time. This allowed several people to use this expensive machine, but one at a time. This is an IME 84RC remote keyboard. At the rear of the machine is another multi-pin socket. This is probably for connecting accessories such as the "Multiconstant box" mentioned in the article below. Note also the wheels at the rear to help moving this heavy machine on the desk. "Multiconstant box—accessory to IME 84 electronic calculator. Up to four multiconstant boxes can be connected to each IME 84 and on each box eight 8-digit constants can be set, including decimal points. The 32 constants can be called up automatically for use in computation." "The optional peripherals now available include remote 'satellite' keyboards, multiconstant box systems, input programme units, data-processing output units, calculating-sequence control units ... and there is more to come." "Office Methods and Machines" in March 1966 announced the IME 84M: "a simplfied version of the IME 84RC for use when no storage facilities are required." Also: "Input Programme Unit provides up to 32 easily set programme steps; facilities also provided for setting two 8-digit constants for inclusion in programme. Output unit links calculator to devices producing a permanent record such as tape punches, automatic typewriters, etc." "(Above) IME Digicorder is the latest peripheral for Muldivo's IME range of desk calculators. Using magnetic discs holding up to 1,500 operation steps, it programs the calculators so that only variable data need be entered by keyboard. Up to five short programs can be held on one disc." The die-cast top and bottom covers are easily removed and reveal the chassis with the electronics neatly arranged for easy servicing. The 16 "Nixie"-type numerical display tubes are red lacquered to give maximum contrast to the displayed digits, and 9 neon lamps between the display tubes on the right are used to provide the decimal point of the display. The power supply is mounted in the gap between the display tubes and the keyboard, and under the keyboard is a long circuit board for decoding the key presses (see photograph below). 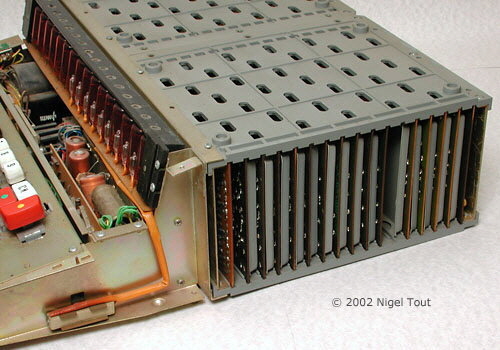 The 32 logic boards are mounted in two racks, one on each side of the machine. Underneath the keyboard showing the key-press decoder board and the power supply. The left rack with 16 circuit boards. 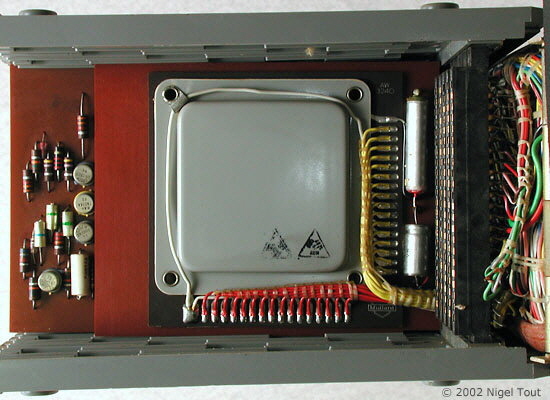 Due to the close spacing of these boards grey, plastic, insulating separators fit between them to prevent short circuits between the metal cans of the transistors on one board and the leads of the devices on the adjacent board. The right rack with a further 16 boards. The magnetic core memory is mounted on a short board in the sixth slot from the rear. Two of the circuit boards with one of the plastic, insulating separators. Only one of the 32 boards in these racks has conductive tracks on both sides. 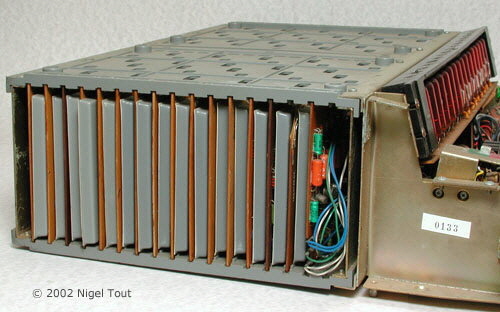 The magnetic core memory is contained within a squat grey plastic box mounted on a short circuit board to wards the rear of the right rack. Click here to go to the page describing magnetic core memories. This board is permanently wired in and cannot be unplugged like the other boards. Behind can be seen components on the next full-size circuit board. 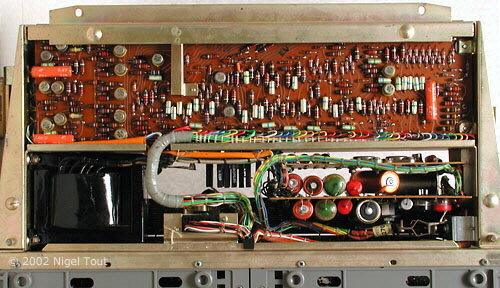 Note that the sockets for the circuit boards (black vertical blocks on the right) are individually wired, rather than making use of a back-plane circuit board. Transistors - circular metal cans often with writing on the top. Resistors - dark brown with coloured stripes. Diodes - small glass packages with coloured stripes. Capacitors - larger yellow, green, and orange packages, with either coloured stripes or writing. 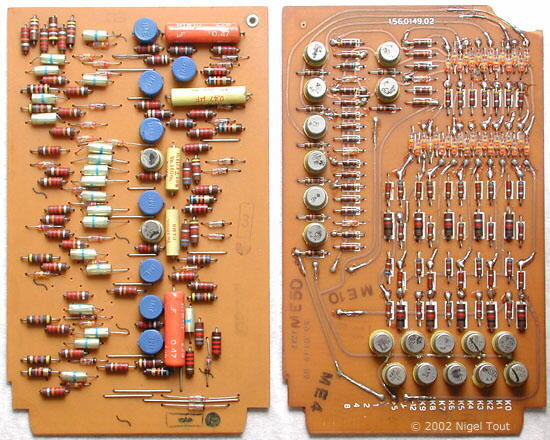 One transistor at the bottom of the board on the left above has a yellow plastic cover. 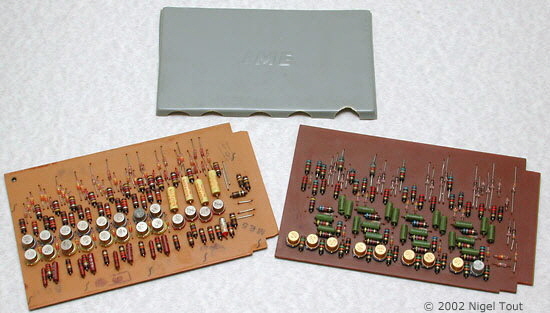 Similarly 8 transistors on the board on the left below have blue plastic covers. This is unusual and may be to protect the transistors from draughts which could affect their operating characteristics. The board below on the right is the only board in the racks with copper tracks on both sides. It has had its top right corner damaged at some time during its life requiring the copper tracks to be repaired. 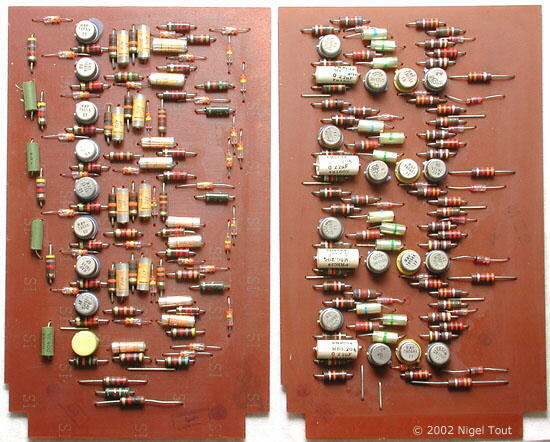 From Texas Instruments, types 2N1305 and A6. Marked "Cosem" (Compagnie G�n�rale de Semi-conducteurs), type 2N1305. Marked "Ray" (Raytheon ? ), types T6055 and T6056. Type 2N1305 is an Alloy-junction Germanium PNP transistor. It is assumed that the other types are Germanium too. A slightly later, simplified machine is the IME 26. Grateful thanks to Ken Buckles for the opportunity to acquire this calculator. "Desk Calculator: Transistorised", Engineering, 15 Oct 1965, p505A. Office Magazine, May 1964, p332. "Equipment Report: Accounting", Office Methods and Machines, Dec 1965, p1041. "BEE [Business Efficiencey Exhibition] at Leeds", Office Methods and Machines, Mar. 1966, p193. "New at the BEE [Business Efficiencey Exhibition]", Office Methods and Machines, Nov. 1966, p916.